(Sent to us by a reader and we traced back to Michele Welton. Michele Welton has over 35 years experience as a dog breed advisor, obedience instructor, canine psychologist, veterinary technician, and author of 17 books about dogs, cats, and pet birds. Do have a look at the site to see what books are available. Often called a "Puggle, this is a cross between a Pug and a Beagle. Beware: lots of shedding! The most common kind of crossbred (or crossbreed) dog is one purebred dog bred to another purebred dog of a different breed. For example, a Golden Retriever crossed with a Standard Poodle produces crossbred offspring called "Goldendoodles." Some people call them hybrid dogs, but that's wrong. You only get a hybrid when you cross two different species. For example, a horse bred to a donkey produces a hybrid we call a "mule". Dog breeds are NOT different species. A dog "breed" is simply an inbred family of dogs within the same species: canis familiaris. The inbreeding (doubling up of the same genes) is what makes a dog breed look alike. Some people call crossbred dogs designer dogs. But that's kind of silly, because purebred dogs are just as much designed as crossbred dogs. For example, breeders designed Border Collies by choosing specific traits that would help their dogs to be expert herders. Border Collies are just as much designed as Goldendoodles. Some crossbreeds have been given "names"
Whether a cross has been given a name or not doesn't matter. It's still a crossbred dog. For example, if a Siberian Husky mates with a Dalmatian, the resulting puppies will be crossbred even though no specific name has been coined for a Siberian-Dalmatian cross. Sibermatian, anyone? Purebred A + Purebred B = crossbred puppies. No cutesy names required. A purebred Pug crossed with a purebred Beagle produces crossbred puppies. That one's easy. But also.... a purebred Pug crossed with a dog who is himself a Pug/Beagle cross STILL produces crossbred puppies. There are still just two breeds there: the purebred Pug contributes Pug genes, while the Pug/Beagle cross produces Pug and Beagle genes. So the pups inherit Pug and Beagle genes. That makes them crossbreeds. Finally, a Pug/Beagle crossed with another Pug/Beagle STILL produces Pug/Beagle crossbred puppies, because again, there are only two breeds contributing the puppies' genes. Many dog owners declare with confidence that their dog is a "Labrador cross" or a "Shepherd-Husky" or some such. But unless they know for a fact who bred the dog, and unless that person can guarantee who the parents were, such declarations are simply speculation. And it makes little difference who's doing the speculating. Many owners ask their vet, but just as veterinarians know very little about dog training and behavior, they know very little about dog breeds. Similarly, animal shelters love putting breed names on cages, but they also know very little about the breeds. If it's medium-large with shortish black hair, they'll guess "Lab cross." If it has prick ears, curled tail, and thick coat, they'll guess "Husky cross." If it's smallish with wiry hair... "terrier cross." The surprising reality is that if a dog isn't a purebred, the chances are much higher that it's a mixed breed (more than two breeds) than a crossbreed (two breeds). Why is it more likely that a dog is a mixed breed rather than a crossbreed? Because the chances are slim that a male purebred dog wandering around twon found another purebred dog, of a different breed, who happened to be female, who happened to be in heat (which occurs only twice a year for three weeks), AND whose heat period was within the limited fertile window (only a few days within that 3-week heat period). Now of course such coincidences do happen sometimes. And some people breed crossbred dogs deliberately. So if you have a dog who isn't purebred, can you find out for sure whether he's crossbred or mixed breed – and which breeds are in his genetic make-up? ​Does it help to know which breeds are "in" a crossbred or mixed breed dog?Let's say you've just gotten a puppy who isn't purebred. Will finding out his breed composition mean you can predict what he will grow up to look like or act like? Will it help you raise or train your dog? Not much. Because even if you know which breeds are in him, you don't know whether those individual DOGS were typical for their breed. There are many purebred dogs who don't look or act like their breed is supposed to. For example, many Rottweilers love strangers. Many Pit Bulls love other dogs. Some Labrador Retrievers are shy or aggressive instead of friendly. Some Chihuahuas weigh 15 pounds instead of 6. If these atypical dogs produce puppies, their atypical genes and traits can be passed on and you might have one of their puppies. So just because your puppy "has pure breeds" in his ancestry doesn't tell you what those individual dogs were like. Therefore you don't know which genes and traits they had available to pass on. 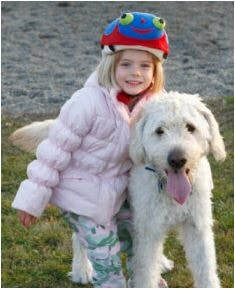 Labradoodles are a cross between a Labrador Retriever and a Poodle. They can make good family dogs – IF you provide enough exercise and training, because they are energetic. Finally, when a puppy's ancestors include two or more breeds, many of their genes may be conflicting. For example, suppose one of your dog's breeds has genes for friendliness. Another has genes for standoffishness. Another has genes for aggression. When your puppy inherits a jumble of conflicting genes, you don't know which genes will "trump" the others, or which ones will blend together to form some intermediate result. Crossbred dogs tend to have a moderate appearance. In The Truth About Purebred Dogs, I explain about the deformities that have been inflicted on many purebred dogs – tiny size, giant size, pushed-in face, protruding eyes, short legs, long back, floppy lips, long heavy ears, wrinkled folds of skin. Deformities can only be maintained by continuously breeding such dogs TOGETHER. ​On the other hand, when a purebred dog with a deformity is bred to a purebred dog without that deformity, the crossbred puppies tend to have an intermediate look. For example, a Pug crossed with a Beagle produces puppies with more natural-looking faces (better for breathing), compared with purebred Pugs. Crossbred dogs tend to have a moderate personality. Crossbreeding tends to produce a middle-of-the-road temperament that often fits better into the average household than the more "extreme" temperaments of many purebred dogs. In The Truth About Purebred Dogs, you learned that most breeds were developed to do some type of work, such as herding, hunting, guarding. They needed traits that helped them accomplish their work, such as high energy, aggression, chasing, digging, barking, and independent thinking. But if you cross a breed with a certain "working behavior" with a breed that doesn't have it, the chances are good that at least some of the puppies won't have it or will have it in a watered-down form that's easier to live with. Crossbred dogs tend to be healthier. All dogs have defective genes. In fact, all living creatures do, including you and me! But often a defective gene doesn't cause any problems unless you have TWO copies of it – one from your mother and one from your father. A purebred puppy has a higher risk of inheriting two copies, since his parents belong to the same breed and share so many of the same genes, including the same defective ones. But parents of different breeds (assuming those breeds are not similar to each other) tend to have different defective genes. This minimizes the risk of their puppies getting two copies of the same bad gene. That's good. Not only that, but the greater variety of genes that a crossbred puppy inherits tends to result in a stronger immune system and better physical and mental health. It's called genetic diversity and it is a healthy thing. Should you get a crossbred dog? So now you might be thinking, "Yup, a dog with a moderate appearance, moderate temperament, and good health is exactly what I'm looking for." You're ready to head off and buy a crossbred dog. And that might be a huge mistake. In her book Dog Quest: Find the Dog of Your Dreams, in addition to giving advice of finding a good crossbreed dog, the author also gives information on the Disadvantages of cross breed dogs, and also which crosses may be a good choice. Post traumatic stress disorder, or PTSD, is not a fully recognized veterinary behavioral phenomenon but some believe it exists and is probably more common than we think. In addition to satisfying our curiosity, finding out your dogs DNA has several benefits you may not have thought of.